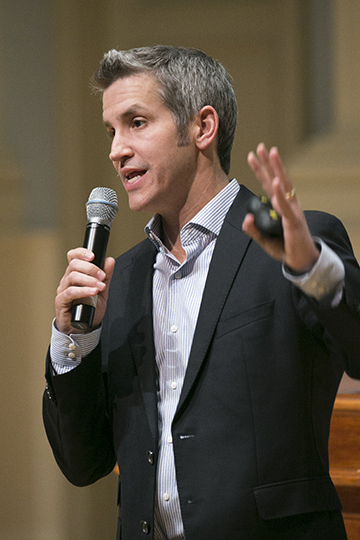 Samford University alumnus and New York Times bestselling author Jon Acuff spoke about his book Do Over as part of the annual Live @ the Library event April 8. In his presentation, he discussed four things needed in every adventure with God: skills, character, relationships and hustle. Acuff shared just how much the world has changed since he grew up. According to Acuff, kids today don’t understand live television or Blockbuster. In the past, hotels competed against one another, but now must compete against more than a million options due to the innovation of Air B&B. New York City taxi drivers used to pay anywhere from $450,000 to $800,000 for their medallion, which serves as their business license. Now, their medallions are worthless because of Uber. At each do over moment, one of these elements needs to be amplified and applied in new ways. Care about what the people you care about care about, Acuff encouraged. Recently, Acuff spoke to chimney sweepers. He found that as a marketing technique, one of the chimney sweepers would ask to take a photo of his clients’ dogs while cleaning out their chimneys. Once the chimney sweeper finished his work, he would turn the photo into a postcard with both the dog’s name and the company’s name on it and mailed it to the client. What would have normally ended up in the trash now was being placed on family refrigerators. How do you know what people care about? Read fewer minds and ask more questions, Acuff explained. “If you want to have empathy, be human,” Acuff said. Even large corporations can show empathy. He shared an example of a Twitter conversation he had with Southwest Airlines. In the conversation, it was clear that Southwest had taken the time to Google him. The company knew more about him while communicating over Twitter, even going so far as to make puns about his recent books. Choosing empathy is cheap, Acuff said. Losing it is expensive. Sometimes, we get so busy we forget to have empathy. Acuff closed by encouraging audience members to not try to win at things that don’t matter and focus on what does. Live @ the Library is an annual event hosted by the University Library to bring awareness to accomplished Samford-affiliated authors. This year’s event was sponsored by EBSCO, and proceeds will go to the library. Acuff, a 1998 Samford graduate, is a New York Times bestselling author of five books. For 18 years, he has helped some of the biggest brands tell their story, including the Home Depot, Bose, Staples and the Dave Ramsey Team. His blogs have been read by more than four million people, and he has more than 250,000 Twitter followers. Aly Hathcock is a journalism and mass communication major and a news and feature writer in the Division of Marketing and Communication.